The credit bubble on the private sector balance sheet imploded during the credit crisis of 2008. Instead of allowing the debt to cleanse itself from the system, governments around the world nationalized the toxic loans. Most financial analysts expect the crisis to continue to worsen in the Eurozone and move next to Japan and the UK. The final destination will be the United States, which will provide the bursting of the final great financial bubble: United States Treasury Bonds. The following excellent graphic provides a global heat map which shows the areas in the most danger. 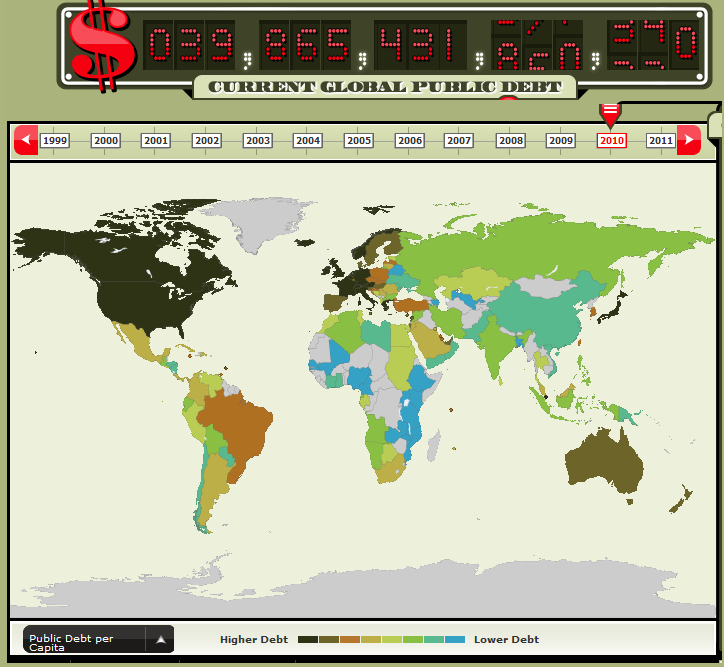 (Black) You can click here for a live update of the global debt clock ticking time bomb.